SYNOPSIS: After a transmutation gone wrong, both brothers lost parts of themselves. They want them back but there's a price. Fullmetal Alchemist is a live-action film of popular manga series of the same name. The manga has also been adapted into two series of animes - Fullmetal Alchemist (2003) and Fullmetal Alchemist: Brotherhood (2009). This manga series is among one of the most successful, achieving both critical and commercial success. The movie follows the first 4 volumes of the original manga series, where Edward Elric (played by Ryosuke Yamada) and younger brother Alphonse (voiced by Atomu Mizuishi) go on a quest to find the legendary philosopher’s stone, which could help bring back their bodies. The story is set in the beginning of the 20th century, at a fictional country of Ametris. The brothers committed a taboo act of trying to perform a human transmutation to bring back the deceased mother who died of illness. But because of the Law of Equivalent Exchange in alchemy, they suffered severe consequences - Alphonse lost his physical body and Edward lost his left leg. In order to save Alphonse’s soul, Edward loses another arm to seal Alphonse’s soul on an armour. Subsequently, Edward replaces his limbs with automail (mechanical prosthesis) by childhood friend Winry Rockbell (played by Tsubasa Honda). Edward becomes a state alchemist, with title “Fullmetal Alchemist”. 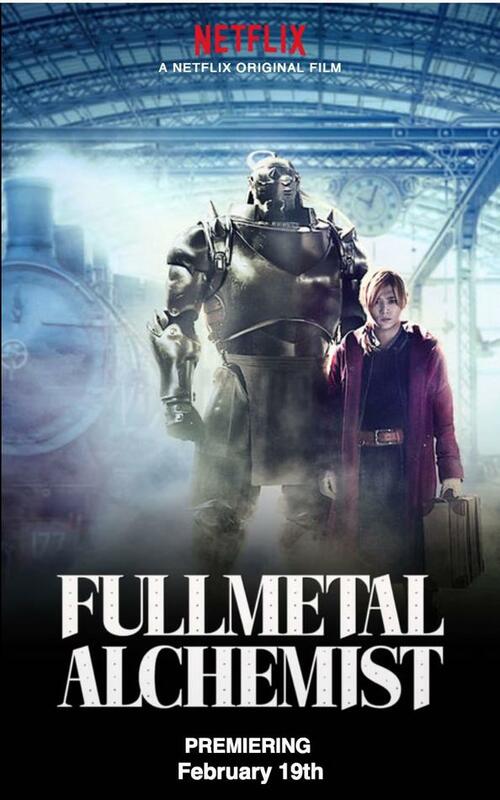 The film is directed by Fumihiko Sori, and features an all-star cast, including Ryosuke Yamada (Edward Elric), Tsubasa Honda (Winry Rockbell) and Dean Fujioka (Roy Mustang). The development of the film was originally planned for earlier, but was delayed because of budget and technology constraints. But the wait was definitely worthwhile, seeing how Alphonse (full CGI) is seamlessly integrated to the movie. According to the director’s statement, the technology employed in this movie is what’s used in Hollywood movies like the Avengers. That indeed brought the bar higher in terms of the quality of CGI used in Japanese movies, and enhances many of the action scenes as well. It is undoubtedly a highlight of the movie. Apart from the seamless use of CGI, what’s applaudable about the movie is it retaining most of the material from the original. It definitely makes it to one of the best manga adapted screenplays. While there are still differences (check out the full list here), they can be considered fine tuning to make the material suit better for a movie. Further, the cast that have most scenes with Alphonse probably have it the toughest - since Alphonse is fully CGI and they would need to act with an invisible character! But both Ryosuke Yamada and Tsubasa Honda, who played most closely with Alphonse, have proved to have no problem in delivering their roles. In fact, Ryosuke has shown much growth and maturity in his acting, a leap from his first main movie role in the Assassination Classroom series. Although there is so much good to shout about the movie, the reception of the movie is surprisingly divided. There are even petty comments which question why Japanese cast are used for foreign characters… But please, it just seemed like people forgot that the creator of the manga is Japanese, and that the story and its backdrop are fictional! If that’s really a valid concern, other series like the Black Butler and The Saga of Tanya the Evil which also have foreign sounding characters, ought to be scrutinised the same way. While there may be people who find it strange having Japanese talking in their ‘non-Japanese’ roles, the bottom line is the movie did its original justice and didn’t introduce any ‘Japanese’ element which could threaten the integrity of the story. To seal the deal, the selection of the locations was thoughtful and the panoramic views are simply beautiful, transporting you to the fantasy world of the Fullmetal Alchemist. Most of the movie is shot in Italy, with selected scenes done in Japan. It was a shame that there wasn’t a theatrical release in Singapore, because it would have been an absolute joy to watch it on the big screen!